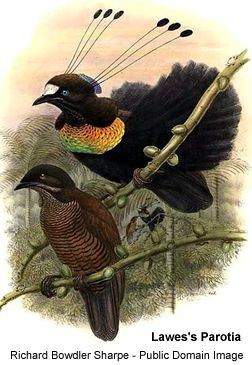 The genus Parotia are birds of paradise (family Paradisaeidae). They are also known as six-plumed birds of paradise, due to their six head quills. They are found on New Guinea, to which they are endemic. 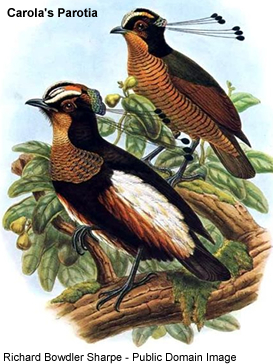 The males of the genus are characterized by an ornamental plumage consisting of six-wired head plumes with black oval-shaped tips, a neck collar of black, decomposed feathers which can be spread into a skirt-like shape, and bright or iridescent head and throat markings. During courtship, they perform hula-like dances and spread out their "skirt" on a patch of forest floor they have meticulously cleaned of dead leaves and other debris. The "hula dances" usually consist of the male hopping from foot and bobbing their heads from side to side! The males are polygamous and do not take part in breeding or raising the young. clutch size is somewhat uncertain; it is probably usually one egg, but on occasion 2, possibly even 3 may be laid (Mackay 1990).